Jehovah’s Witness | ADULT CATECHESIS & CHRISTIAN RELIGIOUS LITERACY IN THE ROMAN CATHOLIC TRADITION: hosting ONLY True Christians!! !, or "How to think Catholic!!" 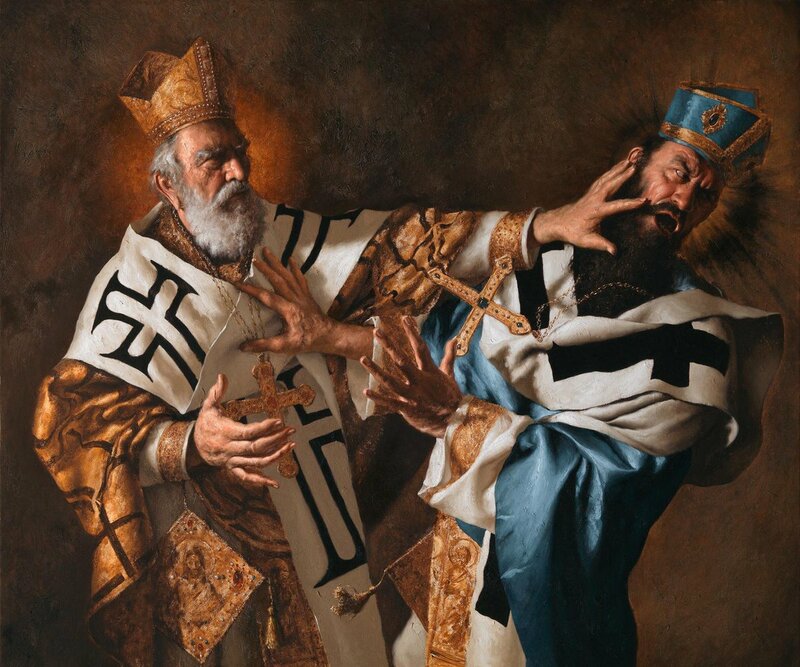 -St Nicholas, yes, THE Santa Claus, smacks Arius at the Council of Nicea, 325 AD. 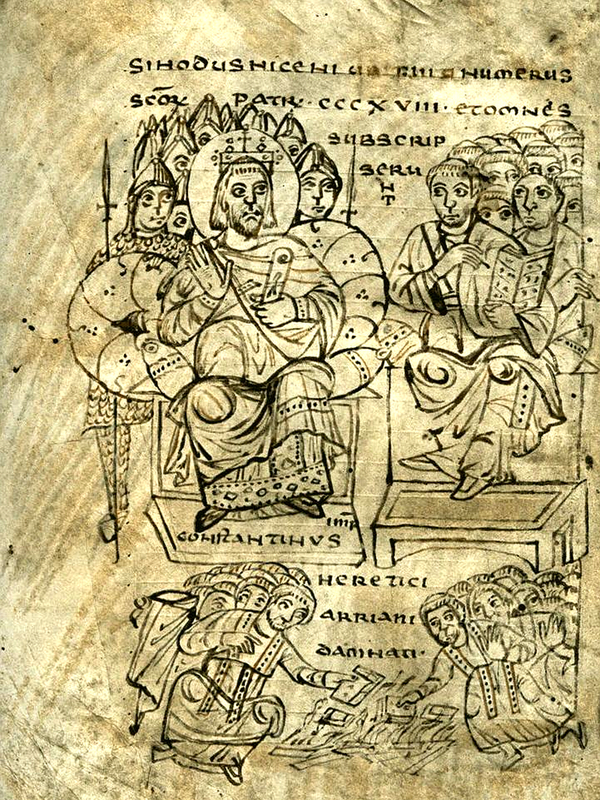 Unable to restrain his dispute with Arius, Nicholas approached Arius and slapped – or punched – him in the face. The bishop’s loss of cool shocked his contemporaries. For more detail, please click on the image. “I was influenced by C.S. Lewis and Mere Christianity as a young Christian and always wished I could go to the closest church to where I lived, as he recommended. As I was researching the matter, I realized that, as for many others, a Catholic parish was actually the closest church to me. This Catholic business was all very hard on my wife, Linda. Like me, she was the offspring of an elder/pastor in the Bible Students movement, and she had been an elder’s wife for over 20 years. We went to the Antiochian Orthodox church a few times, but Linda got migraines from all the incense and had difficulty with the focus on Mary. Their doctrine of communion with the saints in the Church Triumphant is hard for Protestants to accept. Protestants understand communion with the Church Militant, but not with the Church Triumphant. I was praying in a Catholic church each morning, longing to be with Christ the way those who communed could. However, I knew that I couldn’t receive Communion in the Orthodox Church or the Catholic Church unless I converted. I found that hard. Looking back, I can see the sin of pride in myself. Since I had studied, I thought I should be an exception; I knew more than many who were participating in Communion. But now, I see the wisdom of the Church in her unwillingness to compromise on important principles. As a substitute, I found an Anglican church (Anglican Church in North America, a “continuing Anglican” denomination) to attend on Saturday mornings and Sunday evenings, because they let me partake of their communion, which is the “thing” that originally got me going down this path. But what was the Eucharist there? The opinion varied even between their priests. The canon at the church where I attended had Saturday morning prayer with the Eucharist and Sunday evening prayer with the Eucharist. After the Saturday morning Eucharist, he led a men’s Bible study, while his wife led a women’s group. I explained to him that I was an ex-Arian (non-Trinitarian) pastor on a journey, and he welcomed me. So, there was a period of time while I was still pastoring at my old church and also participating in the Anglican worship and communion on Saturday mornings and Sunday evenings. In December of 2014, I resigned as elder/pastor of my church. Leaving my life, friends, theology, and just about everything else, was hard. At least I had a job. I marvel at those who leave a pastorate that then have to figure out how to put food on the table and a roof overhead! My wife eventually came to the Anglican Sunday evening service with me. After we left the Bible Students, we attended there on Sunday mornings as well. She really loved the modern worship they blend into their liturgy. She has come to appreciate liturgy, the belief in the Real Presence, and other Catholic teachings there, but has not become Catholic. Still, she has been supportive and continues to grow in her faith. It pains both of us not to worship together, so I, as a Catholic, accompany her to the Sunday evening prayer at her Anglican church. How could an Anglican canon help me over my prejudice against Catholicism? I learned much at his Saturday morning men’s Bible study. He was always quoting the Church Fathers and treated Catholic teaching kindly. He would point out those Catholic doctrines that he didn’t hold, but knew the Catholic Catechism and Church teachings better than most of the Catholics I’ve met. He is still a friend, and I do enjoy his sermons on Sunday night. What I like about his sermons is that he keeps to the readings for the day. He does not preach whatever he wants, but what his church has given in the readings. I studied my way into the Church. I told one of the other pastors at my old church, “Whatever you do, don’t read Ignatius’ letters to the churches. They will ruin you.” Ignatius of Antioch laid waste my former view of Church history. Here is a man discipled by the Apostle John. He was the third bishop of that important see of Antioch, where there are bishops, priests, deacons, Eucharist, the importance of being obedient to your bishop, and so forth! Additionally, reading Athanasius of Alexandria and his simple point on the Father and the Son being eternal (one can’t be the unchanging, everlasting Father without a Son!) helped me overcome my Arian beliefs. As I read the works of people who knew the Apostles and the first disciples, I realized there was no Great Apostasy in the early Church, except amongst those sects that kept popping up, trying to change what had been handed down. I realized there were only two places I could truly have the Body, Blood, Soul, and Divinity of Jesus Christ (the divinity part being a big deal for an ex-Arian): the Orthodox and Catholic Churches. But through all my studies and experiences, I had to admit there could only be one universal Church, one I could find everywhere, one still united with a Tradition that, though a mighty oak tree today, still retains the image of the acorn of the early Church. While attending an Anglican church, I found some online recordings of an RCIA (Rite of Christian Initiation for Adults) class. Going to the Catholic parish to pray had grown into a daily habit. I couldn’t stay for the whole Mass, but I could do so at least through the Liturgy of the Word. I wished that I could go up for Communion on my days off, when I could stay for the entire liturgy; what was there before me was the real thing. So close, yet so far. I started listening to these recordings of RCIA sessions. My wife was puzzled by my listening to “Catholic stuff.” It was interesting, though, because the person teaching it had gone to Wheaton College (home of Billy Graham) and had converted to Catholicism when he started looking into Church history. He even spent time at the same Anglican church in Wheaton where we were. Linda and I went through RCIA together under him. Linda kept asking, “Where does the Bible say that?” and other, tougher questions about what was taught. RCIA could use some work in this area. Perhaps we could go back to Cyril of Jerusalem and his Catechetical Lectures? Of course, in our age, this is probably easier said than done. On tough days at school, I would also stop by the church after work to pray. There was a side chapel where you could see the Tabernacle and get into the church when the main entrance was closed. One time, I noticed a man praying there, Craig, whom I had seen at morning Mass. He always seemed serene — which I wasn’t. I now know that what I did was breaking protocol, but I turned to him and started asking him questions about the statues, etc. He answered patiently. The next week, while at morning prayer, he came to me with a Daily Roman Missal and a copy of Introduction to Catholicism for Adults by the Rev. James Socias. Craig told me, “You have some studying to do.” We developed a relationship. I was always off to the races, and he was always telling me to take some time and develop a “Catholic mind.” After becoming Catholic, I’m starting to see what he meant. Craig was my sponsor when I entered the Church. I have dealt with Peter and Popes, Mary, and all the usual Protestant issues, and am still adjusting. Stephen Ray, Scott Hahn, Brant Pitre, Mike Aquilina, and Fr. Simon of Father Simon Says on Relevant Radio have been part of my tutelage. I still try to listen to Fr. Simon’s podcasts daily. I also go to his Patristic Palooza on the early Church each October. Another author very important to me is G.K. Chesterton. (Where were you all my life G.K.?) His wit, joy and formidable intelligence are amazing. I tell people about him all the time, saying he’s the most important author of the 20th century that you’ve never heard of. Some new acquaintances recommended the Coming Home Network. 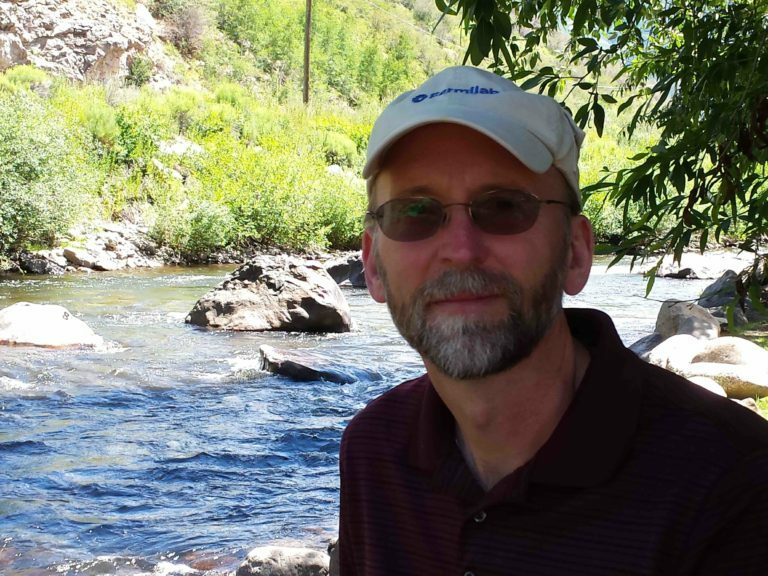 I contacted them, and Jim Anderson has been checking in on me throughout the process of my entering the Church in March of 2017 and following up since then. Just knowing there was someone who cared about me helped a lot. It was also good to read other people’s stories and realize that I was not alone in my quest. It was comforting to realize how many people who were leaders in their Protestant churches were willing to come over to the Catholic Church. With the challenges facing the Church these days, I have found that those of us who have made this journey of faith have little patience for the protestantization of the Church. Interesting timing on God’s part! Being Catholic has meant a much more personal relationship with God. When I was confirmed (I was baptized as a child), I took the name of Elijah, my favorite prophet. We need Elijah and all the saints to help us in these times. As I wandered through those years of searching, I stumbled on the Liturgy of the Hours and daily use the Universalis app (which provides the daily texts of the Liturgy of the Hours and the Mass). I am ashamed to admit that I pray more now than when I was a pastor. Where I pray does matter. How I worship does matter. What matters is not what I want in prayer or worship, but what God wants. I think of Him constantly now. The Jesus Prayer of the Eastern Christians became a saving grace early in this transformation and is still a regular prayer throughout my days. I’m learning the Rosary, the Divine Mercy Chaplet, and other distinctively Catholic prayers. I feel blessed to have ancient aspects of my faith from East and West, as well as a deep love of Scripture from my Bible Student formation. I am blessed to be able to physically be with our Lord daily. I am blessed, too, with having Catholic parishes in abundance around me. I have spent a day in prayer at St. John Cantius in Chicago, one of the most beautiful churches in the states. Last season, I was able to attend there for the entire Triduum (Thursday, Friday and Saturday of the week that precedes Easter Sunday); it was amazing, as are the parishioners there in their devotion. On Sundays, I am blessed with a parish nearby that celebrates an Extraordinary Form Mass (the old Latin Mass) as one of its five Sunday Masses. I’m also part of a band of men who meet Saturday mornings at 7 AM to go over the Sunday Mass readings together. In addition, I’m a part of a smaller group of men who meet twice a month to study papal encyclical letters. We have just finished Casti Connubii (On Christian Marriage, by Pope Pius XI) and are now learning Humanae Vitae (On Human Life, by Pope Paul VI). After that we will tackle Pascendi Dominici Gregis (On the Doctrines of the Modernists, by Pope Pius X). Each of these encyclical letters deals with key issues of our contemporary society and culture. We also study spiritual disciplines and the Sacraments. 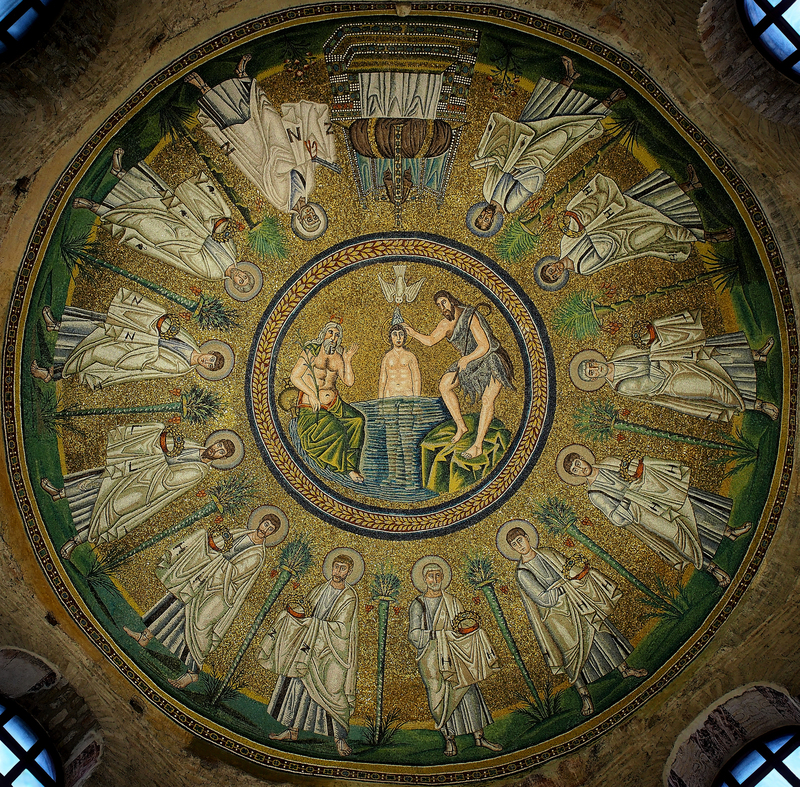 -ceiling mosaic of the Arian Baptistery, built in Ravenna by the Ostrogothic King Theodoric the Great (454-526 AD), please click on the image for greater detail. “Following the lead of others, I encouraged our congregation’s move away from simple worship of some hymns and readings before the sermon to a more Evangelical-style worship with a band. We developed various themes and programs to try to keep people interested and coming. It was a total flop. As many Protestant churches have discovered, if you try to keep people entertained or emotionally tied, it quickly reaches the point of diminishing returns. Now, as a Catholic, being in Jesus’ presence daily as I pray before the Tabernacle is the most important part of my day. In contrast, the way I lived out my Christianity through my Bible Student upbringing was a “head experience.” Being a science teacher as well as a pastor supported keeping everything in my head. But my real need was to live Christ in body, soul, and spirit. Getting the right program or manner of worshiping was not the main thing. As I started studying early Church history, I encountered the early Christians and Church Fathers. These were people who lived out Jesus’ teaching and promises. I didn’t need New Age magical thinking. I didn’t need a program, a new form of worship. I needed to submit to God, worshiping the way He wanted, not the way I wanted. That is the main thing: full submission to Him, to His will. But I only realized that later. On the other hand, I started to stop by a Catholic parish in my town on my way to work. It is the only Christian church that is open at 5:45 AM weekdays for people to pray; they have a daily 6:30 AM Mass. I was beginning to appreciate sacred spaces and places. However, I had a hard time dealing with Catholic doctrine. I had been well-trained to dissect Catholic thought and practice — at least the caricature of it that we were taught. Catholics were (and sadly, still are) pretty easy targets to “evangelize” away from their faith. Very few Catholics I met knew their Bible, their history, or how to defend any of their practices. So, since I “knew” that what I was looking for couldn’t be the Catholic Church, I first looked at Orthodox writers and thinkers. It is funny how our prejudices work. I couldn’t bring myself to look into the Catholic Church, but I was OK with looking into the Eastern Orthodox — all the while praying each morning in a Catholic church. People thought the Orthodox faith strange, but I didn’t get the strong reactions I did later as a Catholic. I was blessed during my time studying Orthodoxy. The Orthodox schism of 1054 fit in with my Protestant idea of the Church “going off the rails,” but I had to move to much later the date of the “Great Apostasy.” Among Orthodox writers and saints, I could see the promises of Christ being lived out. Reading of the monks of Mt. Athos, the Eastern Fathers, the rich liturgy, and abundance of miracles, I thought that I was on the right track. I began to challenge people to look into the Orthodox faith, pointing out the wonders and beauties I had discovered. A lot was going on at that time. I was taking classes at the Antiochian Orthodox seminary and knew my future was taking me where my brethren were unwilling to go. I had been trying to re-create the early Church, as many Protestants have, within the confines of my own church. That was not fair to them. 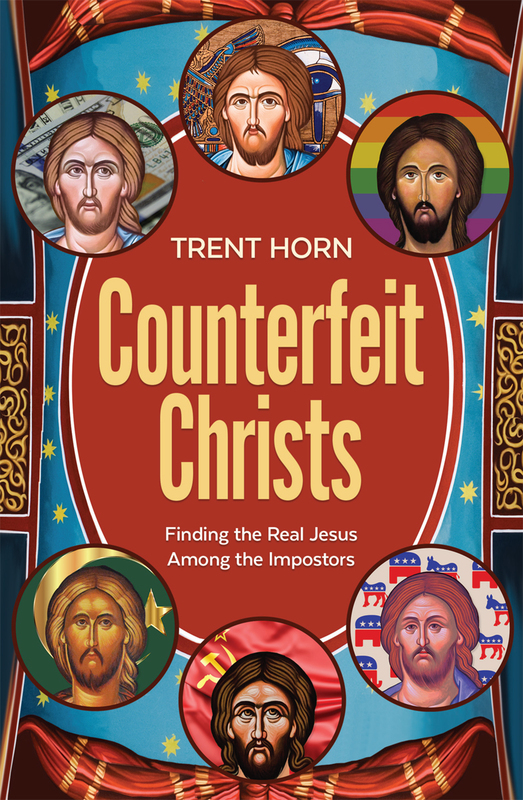 It didn’t take a full semester to realize that I was running into many of the same issues in the Orthodox Church that I saw in Protestant churches. The nationalism of the various sects of the Orthodox was troubling. Attending various Divine Liturgies was enlightening as well. In the Antiochian church nearby, the people were very devout. In my sampling of other Orthodox parishes, not so much. Still, the Orthodox Churches have apostolic succession and the true Presence of Christ in their Divine Liturgy. 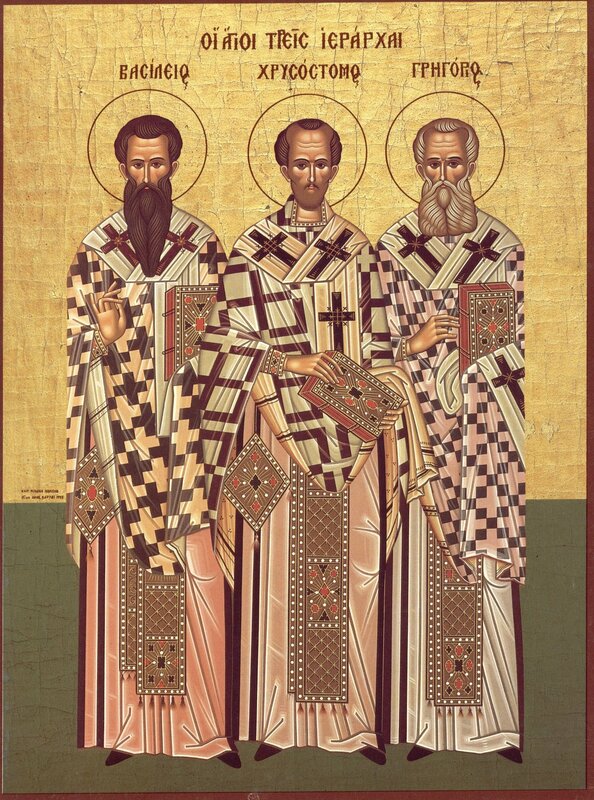 -Great Champions of the Catholic Faith, fierce combatants against the heresy of Arianism, the Cappodocian Fathers: St Basil and St Gregory of Nazianzus, along with Basil’s brother St Gregory of Nyssa and St John Chrysostom, fought against Arianism. For greater detail, please click on the image. “My family left the Catholic Church when I was in first grade. I had only one year of Catholic education. Being the oldest of seven, none of my younger siblings had any at all — and not one of them has anything to do with the Church today. My parents joined the Bible Students, a small non-denominational group, descendants of Pastor Charles Taze Russell. 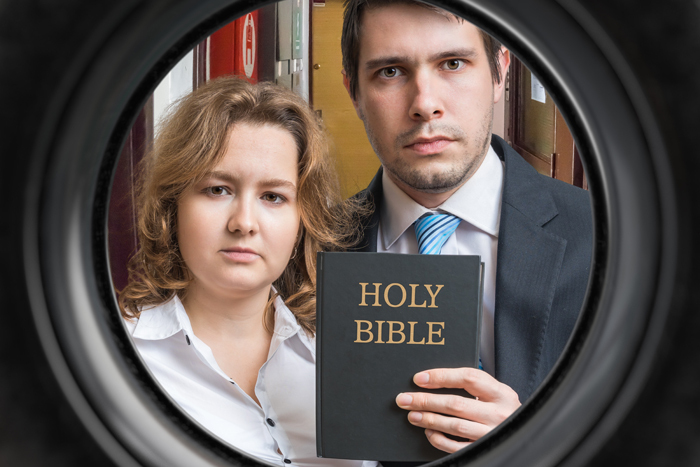 They are not the Jehovah’s Witnesses, as is commonly reported. The JWs really came from one of Pastor Russell’s board members, Judge Rutherford. That is a story for another day. Sundays meant long drives to “Meeting.” Except for one faction of the movement, known as Bereans, we didn’t call it “church”; instead, we met as ecclesias. Bible Students like to use Greek, since that’s what Pastor Russell did. The groups were small (their peak was just before World War I), and they often met in homes, Masonic temples, or the local YMCA. Very few congregations owned a building. Most Meetings were spent studying Russell’s Studies in the Scriptures, his topical Bible studies. Some “liberal” Bible Student groups, such as the Bereans, actually studied the Bible. I was blessed to be involved with all three flavors of the Bible Students at different times. I do not regret the strong love of Scripture they gave me. Growing up in a group that is considered a cult by other Christians does tend to make you pay more attention to what is being taught. I can remember being told that I was going to hell by many a Christian as I tracted neighborhoods or worked a booth at the county fair. On the other hand, being part of a small group that is, to some extent, persecuted also gives you a sense of being special in the Lord’s eyes. I think that is a very important part of many of the smaller denominations within Christianity. I grew up going to the seminars, conventions and other ways the small ecclesias would work to build up the Body of Christ. I was blessed with being around people who were very bright and knew history, the Bible, and how to think for themselves. I loved going to these Meetings and developed close Christian friendships. In the Bible Student movement, nobody in leadership is paid. Everyone who serves the ecclesia needs an outside job. To pay the bills, I was and am a science teacher. One of the other elder/pastors I worked with was the math chair at the local high school. Another was in charge of internal sales for industry. There are different types of Bible Students. The Dawn group was the group that formed after Judge Rutherford kicked everyone out of the Watchtower. They set up their own printing press and started The Dawn magazine. The Divine Plan faction was formed in the 1960s and 70s as a reaction to the practices of the Dawn Meetings, who had stopped using some of the volumes of the Scripture Studies. Another group, known as Free, or Berean, Bible Students, developed in the 1930s and 40s. I eventually became a deacon and then an elder in a Berean congregation. The Bereans were considered to be “out of the truth” by many in the other groups. Bereans only study the Bible, and many Bereans today have no knowledge of the Studies in the Scriptures. When my parents entered the Bible Student world, they met with a Divine Plan group first, then with some people from that group who started a home church. As a teenager, I got to know brethren in the Dawn faction; in fact, I married a girl from there. In short, within our own denomination, we experienced the fractures of Protestantism in spades. What does it mean to be an elder in the Bible Student movement? It means being a pastor who does the preaching, teaching, counseling, marrying, burying, and other duties of a typical Evangelical pastor — plus working full time on the outside. That is why they usually have several elders. At the time I was active in the denomination, my congregation of 100–120 had five elder/pastors. I could tell from Scripture that the early Church had Communion more often than our once-a-year practice, although apparently some in the early Church had an annual practice. Then I made another mistake: I started to study Church history. It turns out that Church history, in Protestant churches and cultures, leaves out a lot of information and is quite comfortable sharing historical information that isn’t really history. One very helpful book to disabuse me of this error was Rodney Stark’s Bearing False Witness. Stark was a Protestant historian fed up with the false narrative about the Catholic Church passed off as history. As I learned, I shared. Communion started to happen a bit more often in our church. But when your theology says it is only a symbol, Communion does not have much importance or urgency. I can remember sharing from the platform during sermons that I envied the Catholics’ ability to have Christ daily in such a literal way. Nobody agreed with that. I was the one out of step, because I had come to realize that it wasn’t just a symbol. Jesus meant what He said, and His listeners took it the same way, as is clear from John 6.